Last summer, I wrote a piece speculating on whether the nonadmitted market had reached a “new normal.” Nonadmitted market had been hovering close to 5% for a few years, even though 1) the historic norm is about 3% and 2) the hard market of the early 2000’s had ended some time ago. The “new normal” persisted through the end of 2012 (see figure below), and early data suggest that a similar conclusion will apply to 2013. If this is in fact a “new normal,” the shift is a tectonic one. By going from a 3% share to a 5% share, the nonadmitted market has effectively increased its size more than 60% in relation to the overall property-casualty market. Such dramatic change demands closer examination. Market growth reflects new opportunities for E&S insurers, but it also means new and potentially unfamiliar risks. When we look closer, we see that the nonadmitted market is not just growing—it’s in the process of shifting in composition. As recently as two decades ago, liability risks were the predominant focus of surplus lines underwriting. In the current day, however, property risks—and in particular those with catastrophe exposure—are rising in prominence. However, while shares in both property and liability are comfortably above their pre-hard market levels of 1999, there is a noteworthy divergence after the market peak in 2004. 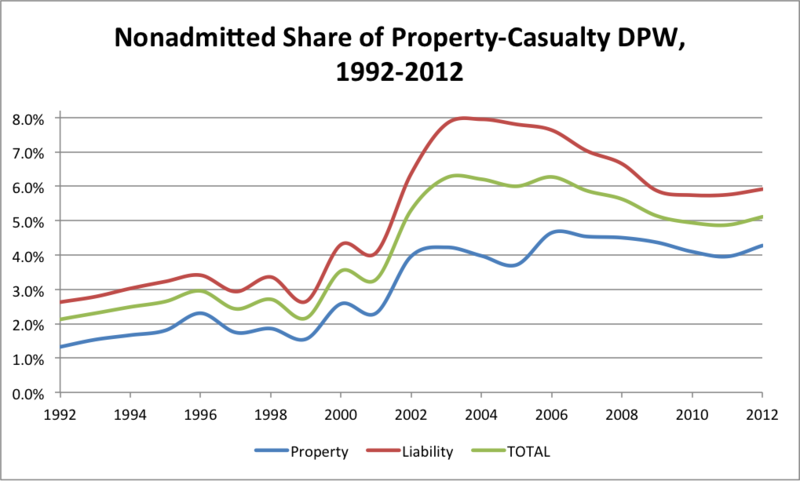 Liability share followed the expected pattern of easing as the market softened; property share did the opposite—rising from 4% in 2004 to 4.3% in 2012. It turns out that this strengthening is reflective of a longer-term rise in the importance of property both in the nonadmitted market and the overall market. 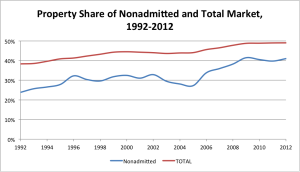 In the early 1990’s, property premiums accounted for less than a quarter of overall nonadmitted premium. Property share now exceeds 40%. A good portion of this shift can be attributed to the growth of catastrophe exposures and the flight of admitted companies from the same. The last quarter of a century featured a number of disasters that engendered retreat from various geographies and perils. Hurricane Andrew (1992), the Northridge Earthquake (1994), the September 11 Attacks (2001), and Hurricane Katrina (2005) all led to significant reevaluations of risk within the industry. Many admitted companies responded by limiting their exposures, with the consequence being an ongoing redirection of catastrophic risk to state-sponsored insurance schemes, reinsurance markets, and the nonadmitted market. Evidence of this can be found in the case of the southeastern United States over the past decade. 2 As the overall market softened after 2004, nonadmitted market share was subjected the usual pressures. 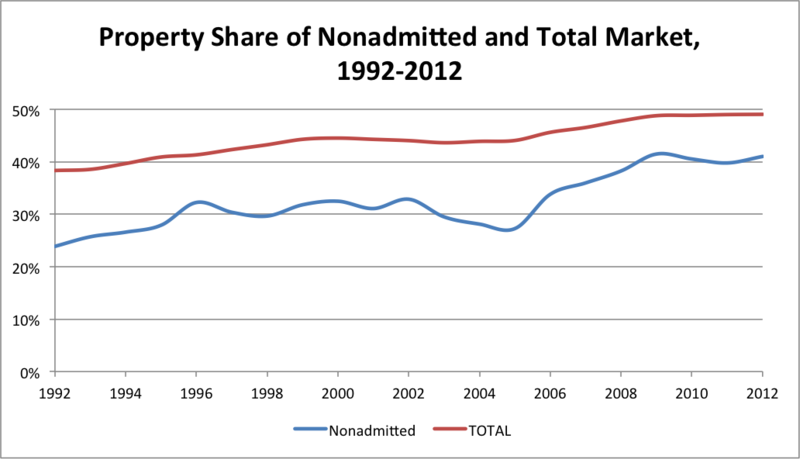 Outside of the coastal states in the South, nonadmitted share fell from 6% in 2004 to 4.4% in 2012, with overall volume falling about 20%. Share in the Southeast, on the other hand, slipped only slightly from 6.9% to 6.6%, and overall nonadmitted premium volume actually rose by 13% over the same period. 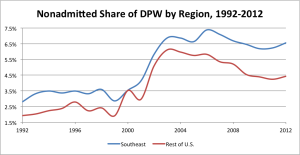 The post-2004 growth in the Southeast can be attributed to the aftereffects of the 2004 Florida hurricane season, Hurricane Katrina (2005), Hurricane Ike (2008), and other windstorms. These events served to accelerate the retreat of standard underwriters from hurricane risk, driving yet more property business into the arms of the nonadmitted market. 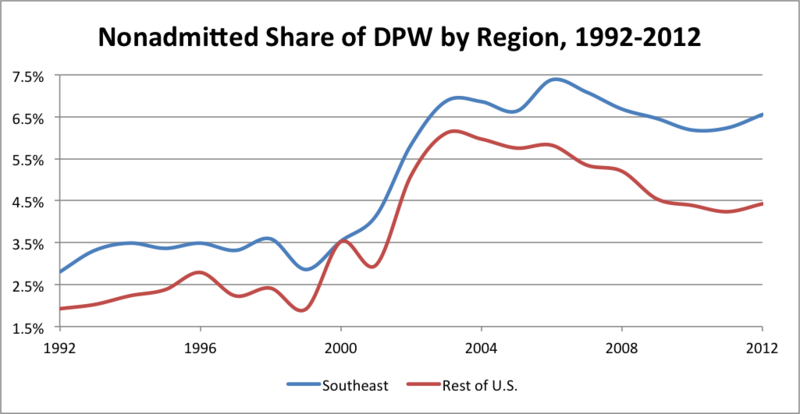 Consequently, the Southeast region’s nonadmitted premium volume surged after 2004 even as the liability market softened, playing a key role in establishing the “new normal” of today. Is the E&S industry ready for the “new normal”? On the one hand, one could argue that there is nothing new here. 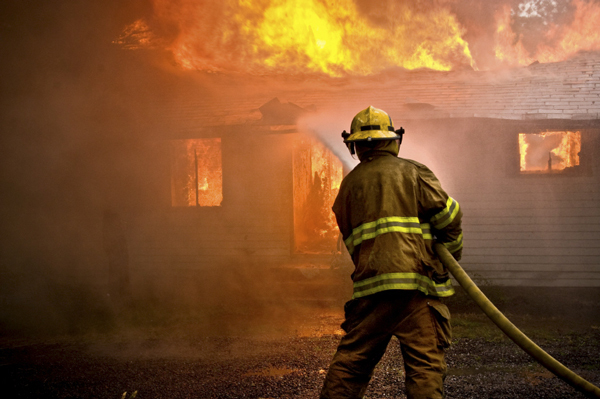 E&S underwriters have been managing catastrophe risks since the industry’s birth. After all, the surplus lines market originally emerged as a safety valve for the property insurance market of the late 19th and early 20th centuries, with the necessity of such a safety valve becoming apparent only in the aftermath of major conflagration catastrophes. On the other hand, much of the industry’s capacity in recent decades has been dedicated to the underwriting of problematic liability exposures, and the underwriting of property catastrophe risk is a much different beast. The retreat of standard underwriters from property risks in coastal areas has created attractive opportunities for newcomers, but those wishing to take advantage must attend to the task of managing catastrophic windstorm exposure—and the risk management undertaking becomes more complex and more important as the exposures grow. Carriers with a historic focus on liability risks may be finding that property catastrophe exposures are accumulating through the sale of package policies in coastal areas and other channels, in which case catastrophe risk management may no longer be an item of second order importance.